Selfish? Greedy? The Knicks' star knows his rep. But he has a plan to change all that: Make more money. CARMELO ANTHONY ARRIVES a few minutes late to his second job, and he hurries into a back office to change out of his basketball uniform and into a sweater and loafers. "Sorry, sorry, a CEO should never be late," he says, apologizing again to his staff of six, which assembled for this urgent meeting in Brooklyn at his request. An image consultant has come from Manhattan, and a branding expert has flown in from Los Angeles. His chief of staff hands him a laptop, and his assistant offers coffee. All of them follow Anthony into a sparse meeting room with wall-to-ceiling windows and a single desk. Anthony purchased this office space about a year ago, even though he was still unsure what he wanted to do with it -- still unsure what he wanted to do himself. The space was in need of transformation, and Anthony was ready to be transformed. Like its new owner, the office offers mostly imagination and unrealized potential: a prime location on the 11th floor of a high-rise overlooking the East River, with the old nameplate for Brooklyn Industries still affixed to the outside door. There is no hint that its current occupant is an NBA star. Anthony redecorated the walls with African art and a portrait of Albert Einstein. He rented two nearby billboards to announce the rollout of his new social media campaign and imprinted them with a slogan that has become his personal quest: define yourself, the billboards read, which is also the reason he is holding this meeting now. "So who exactly is Carmelo Anthony?" asks the branding expert, Anthony Rodriguez, kicking off the meeting. "What do you want to be known for?" "That right there is the big question," Anthony says. "Are you a basketball player? A New York Knick? The league's most unstoppable scorer?" Rodriguez asks. "No way," Anthony says. "This isn't just about basketball. I hate just being known that way. It's got to be bigger than that." "When you've never had something, you want it worse than anything." Anthony turned 30 earlier this year, a birthday that brought about its own kind of identity crisis, but on this evening he is especially in the mood for self-examination. He just flew back from a preseason Knicks game at the Carrier Dome in Syracuse, where many of the fans came wearing his No. 15 Orange jersey, the one he last wore when he was 18 years old. Being in Syracuse was like "visiting a time warp," he says, with Jim Boeheim again watching courtside and hundreds of fans waiting outside the locker room with Sharpies and faded 2003 NCAA championship memorabilia. The experience left him wistful; Syracuse is the one place where he is still uniformly beloved, still a winner, and where nobody debates his abilities, his motives or his legacy. "It was all pretty simple there," he says, because that was before the money and all the criticisms that came with it: selfish, greedy, overpaid. "Twelve years since then," he says. "Can you believe that? And that right there is the last time my reputation was really exactly how I wanted it to be." His professional life has brought Anthony many things: a wife, a son, seven NBA All-Star Games, a scoring title, a couple of Olympic gold medals and, yes, ridiculous amounts of money. He just signed a five-year contract with the Knicks worth $124 million, forgoing a better chance to win a quick NBA title with the Bulls and instead staying with a lesser team that offered a longer, more lucrative deal. "I've got money. That's not the problem," he says. The problem as he sees it is that he is still defined mostly by what he lacks. No championships. No universal adoration. No sense of peace with his own place in the world as he begins the transition from the prime to the twilight of his career. "What I really want is a bulletproof legacy," he says. "How can I be known for being a visionary, for being truly great?" 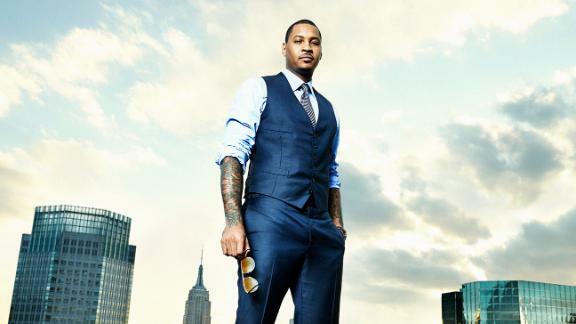 Carmelo Anthony talks about his business ventures in the tech world as he prepares for life after basketball. In the meeting room, Anthony's branding experts begin to offer their versions of an answer. Anthony recently started a tech investment firm -- "my big push for greatness in the future," he calls it -- and now he is obsessing over how to grow his influence. He wants to brand himself as the "tech pioneer athlete," he says. He wants to be known in 20 years not only as "the basketball player but also as the innovator, the business tycoon." He wants to invest in startups and multiply his bank account by 100, because maybe billions can solidify a reputation in ways that millions can't. Now Rodriguez begins a presentation on a digital whiteboard, a series of charts and spreadsheets that track Anthony's cultural imprint. "Here's where you stand," he says, pointing out the 1.7 million page views on Anthony's website in the past year and the recent doubling of his Twitter followers. "That's good. That's real impact," Anthony says. Rodriguez flips to the next slide, which compares Anthony's online influence with that of the men he is always stacked up against. Anthony is fifth. First comes LeBron James. Then Kevin Durant, Kobe Bryant and Dwyane Wade. These are the recognized superstars in a game in which Anthony is cast as the almost-superstar. These are the players whose legacies he covets. This is the order in which he fears history will remember him -- always in fifth, just a few beats short of greatness. "Forget basketball for a moment," Rodriguez says. "What some of these guys don't have is a vision. That's where you distinguish yourself. You're a guy who came up from the projects in Baltimore and achieved the American dream, and now you can share that with a generation of fans. You still have grit. You still have authenticity. We should take your website and do more videos, more lifestyle content, more of the high-tech stuff you're into." Then Rodriguez tells Anthony what so many others have told him during meetings like this: If he wants to redefine his legacy, he has to act now, both on the basketball court and beyond. Because in five years, when he's retired or scoring only 12 points a game, nobody is going to care what he puts on his website or what technologies he likes. There won't be 1.7 million page views. His Twitter audience won't be growing. He'll be done. Irrelevant. "Do it now while people are still watching," Rodriguez says. "You make it sound like I'm dying," Anthony jokes. "There's real urgency," Rodriguez says. "I don't want you to call me when you retire and say, 'Hey, what happened? Where did the market go?' You want the money to keep coming in, right?" "It's not just about the money. I want more than that," Anthony says. "You want to be a cultural icon, a taste-maker," Rodriguez says. "Yes," Anthony says, nodding, and in the empty and cavernous office his voice sounds small. "I want to build something that lasts." WHAT SET HIM on this quest for redefinition wasn't losing in the first round of the playoffs eight times, or being called selfish or greedy, or being plastered on the back page of the New York papers a few hundred times under headlines like "Losers!" and "Stinko De Melo." No, the thing that finally made him doubt everything he had or hadn't done during his NBA career was the throwaway answer his 7-year-old son gave on a homework questionnaire, when asked to write a few sentences about what his father did for a living. "Basketball player," Kiyan Anthony wrote, and then he left the rest of the space blank. "I hate it when people say that's all I am," Anthony says. "I don't want to just be an athlete. I kind of obsess on that sometimes. I don't want my son to be reading, oh, 'disappointment, just a scorer, selfish, didn't win enough, never quite the best' -- whatever. I want to be bigger than that. I want to shape my own destiny instead of just having him read about whatever on the back page." So early in 2013, as Anthony entered the last year of his contract with the Knicks, he began thinking not only about his next contract but about the future that awaits him after he stops playing. He studied other athletes -- David Beckham, Andre Agassi, John Elway, Michael Jordan, Magic Johnson -- whose postcareer brands he admired and called some to seek advice. "How can I control my own reputation? How can my influence outlast my career?" he asked. Anthony says they all told him the same thing: Find one thing you're passionate about and start building on that now. Anthony had always been passionate about money -- not just the cash itself but the luxuries it afforded him and the ways in which it signified success. He'd grown up with none of it, first in a housing project in Brooklyn and later in Baltimore, where his mother worked as a housekeeper and received food stamps. As a 14-year-old, he was held up at gunpoint for $20 and decided he would take his chances and run rather than hand over the cash. "The Pharmacy" was how some referred to his neighborhood, because the only people who had money dealt drugs. "I could have gone that way," Anthony says. "Some friends did. But I started seeing that maybe with basketball I could make more money than they did." Money in Baltimore equaled power. It meant success. The person with the most cash in his pocket was the one who had somehow navigated the world and come out better off. "When you've never had something, you want it worse than anything," he says. Most of his decisions since then have been made with money in mind -- leaving Syracuse after his freshman year despite his mother's pleas for him to stay in school, because he knew he would be drafted at worst third; buying a 21,000-square-foot estate in Denver even though he sometimes lived in that mansion all by himself; calling Jeremy Lin's 2012 contract with the Rockets "ridiculous" because it was too high. Along the way he developed obscure high-end habits that tended to show off his wealth: Nicaraguan cigars. Italian top hats. Ascot ties. Rare red wines. Vintage sneakers. Installation art. Ralph Lauren and Gucci. He hired a New York stylist to buy his outfits and deliver them with personal instructions about when and how they should be worn. He still wanted to look like the guy with the most cash in his pocket -- like the kid from the Pharmacy who had navigated his way to the top. "People say I am all about more money, but it's not like that," Anthony says. "It's about having the appearance of someone with success. Image and reputation matter to me. If you're being honest, they matter to everybody. Money is about people thinking of you as someone who does well." So as Anthony played out the final year of his contract with the Knicks last season, he experimented with ways to associate himself with luxury. He co-founded a watch magazine. He offered style tips to the British edition of GQ and talked to advisers about starting a line of luxury hats or buying land to open a winery in Napa. Maybe one of those endeavors could be his legacy, he thought. Maybe somewhere in there was his greatness. "You need one big idea," his manager told him one day. "I don't think you've found it." Then in January of this year, his wife introduced him to Stuart Goldfarb. THEY MET AT a book party, and at first Anthony thought they had no reason to talk and nothing much to talk about. "My wife is basically pushing me toward this dude, who's probably 60, a finance guy I don't know from nobody," Anthony says. His wife, La La, a noted media personality, knew Goldfarb from a boxing gym where they both worked out. Goldfarb had joined the gym to train for a charity fight, and La La had become his workout partner, his motivator and a friend. "You'll like him," she insisted. After a few minutes of conversation, Anthony did like him, and he recognized in Goldfarb some of the characteristics he wanted for himself: an easy self-assurance, a clear vision and the confidence of a man whose legacy was already built. Anthony started inviting Goldfarb over to his house after games, and he offered him wine and drew out the details of his biography. Goldfarb had been the CEO of Bertelsmann Direct North America, a marketer of music, movies and books with billions in annual revenue. He had also directed worldwide business development for NBC, but he was now mostly retired, serving on a few boards and mentoring some younger investors and media businessmen. "What do you want to do long-term?" Goldfarb asked Anthony one night, already sensing his restlessness. Anthony started listing his interests: wine, cigars, clothing, art. "The high-end stuff," Anthony said. "You're forgetting one," Goldfarb said. "What about tech?" "You're right," Anthony said, because he always has been a self-described gadget freak, traveling on road trips with two iPads and three pairs of headphones. He likes to watch infomercials into the early morning, ordering whichever gadgets interest him and testing them out for a week before giving them away to friends. He told Goldfarb about a GPS monitoring device he wears regularly between his shoulder blades during Knicks practices, made by a company called Catapult. The device measures his acceleration, agility and force. "This could be a real opportunity for you," Goldfarb said. "There could be some interesting investments here. You have a great Rolodex. You've got connections. You can open doors other people can't." When the Knicks' 2013-14 season ended, a disappointing 37-45 campaign, Goldfarb and Anthony flew together to LA and San Francisco to meet with tech companies and venture capitalists so Anthony could learn more about business. "He's intuitive and effective in ways that are surprising to some people," Goldfarb says. "He's quiet, but when he says something it's almost always on point." Goldfarb showed Anthony how to look for key phrases in business plans. He sent him links to tech blogs. When they returned to New York, they scheduled three or four informational meetings each day with tech entrepreneurs. Anthony would work out from 8 to 11:30 a.m. and then come to his office for the meetings. "Stu has the experience, the connections and the real business know-how," Anthony says. "Carmelo has a good creative sense, a lot of influence and really, really big dreams for himself," Goldfarb says. Before the summer ended, Anthony and Goldfarb agreed to formalize their partnership. They would identify promising tech startups together, splitting the investments fifty-fifty. Anthony had chosen tech to be his passion, but he didn't want to invent his own products or necessarily become an adviser to certain companies. Instead, he and Goldfarb agreed that their primary goal would simply be to invest money and make a profit, hopefully enough to "show that what we're doing here is a huge success," Anthony says. They named the company M7 Tech Partners, although Anthony sometimes refers to it as something else: "Stage two." LATE IN OCTOBER, after a preseason Knicks practice, Anthony pulls out his laptop and navigates to a site called CrunchBase. "This is where I spend most of my free time now," he says. The Knicks are a few days away from opening the season, their first under new president Phil Jackson and his triangle offense and the 12th on which Anthony's reputation seems to hinge. "People say every year is the one that will determine if I'm great or terrible, if I've met expectations or been a disappointment," Anthony says. "To be honest with you, I'm tired of it." He knows he is sensitive to what people think of him, and in earlier seasons he sometimes styled his play in a failed attempt to appease his critics. "I passed more if they said to pass more or shot more or whatever, and that's no way to live," he says. Now he has vowed to stop reading about himself in the newspaper or watching sports on TV. When his teammates turn on ESPN in the locker room, he logs on to CrunchBase. The screen shows nine investments that Anthony and Goldfarb have already made -- one more has been announced publicly since, and two or three more are due in the coming weeks. They have staked tens of thousands of dollars into a company that creates digital children's books and into an education venture that trains programmers in Africa. Some investments relate to sports -- like SeatGeek, a search engine for event tickets -- but Anthony has also put tens of thousands of dollars into ride-sharing (Lyft), a smart nutrition scale (Orange Chef) and voice messaging (Cord Project). He plans to make several dozen investments, with the expectation that more than half of the companies will fail and a few will do moderately well. The key, Goldfarb says, is finding a few "hundred-exers," investments that multiply by 100 or more, which is why Anthony reads through a dozen business plans each week and Goldfarb takes five meetings every day. In just the past three months, they have received pitches from hundreds of companies. "The blessing and the curse of being a famous athlete is that you get pitched a lot," Goldfarb says, and Anthony is still learning how to sort through the deluge. He calls business founders from the bus on the way home from games, and he reads business plans in his hotel room on the road. "For every 30 bad business plans, there might be two or three that look pretty good to me," he says. "Some get real outlandish. But mostly it's common sense, like: 'Yes, I can see that idea. I would buy this. I would use this.' And that's when you want to bet big." Their own business faces similarly long odds in a saturated tech market flooded with venture capital firms much larger than M7 Tech Partners. But Goldfarb has three decades of connections, and as an investor Anthony offers companies not only money but cachet. He and Goldfarb meet in person with companies before finalizing an investment, and Anthony and Goldfarb assume their distinct roles. Goldfarb breaks down numbers, looks at the odds, studies the market and estimates success rates. Anthony mostly listens and waits until the end of a meeting to begin his line of questioning, which tends to be less about a business than its founders: How will they react once their product goes public? Once it gets criticized? Once their own ideas get mixed with public opinion? "You're going to be judged. Can you take it?" Anthony says he asks, informed in part by his own experience, and then he concludes each meeting with the same question. "Long-term, why are you doing this?" he asks. "What's your real motivation? What's your endgame?" IT'S THE QUESTION he is also still answering for himself, and sometimes, when he wants space to think, he heads out of his office and onto the roof. There is no door to the roof; it is officially off-limits. But he opens a window marked with red tape and climbs out onto a sloping floor. There is never anybody else up here, especially not at night. "You're invisible," he says. He can stand by himself and see over the East River, across the Brooklyn Bridge and into Manhattan. Out to the left is the gentrifying Red Hook neighborhood, where he lived in a housing project for the first seven years of his life. Out to the right are the billboards plastered with his image. The lights of the city skyscrapers reflect off the water, and the wind mutes the sound of traffic. It is his favorite place to think. It is where his anxieties and ambitions come into sharper perspective. "I really do love this city," he says. "It's the best city, but it's also a tough-love place." He arrived in New York as an eight-year veteran, but in some ways those first months in New York taught him how little he actually knew. He felt scrutinized in Denver, but everything intensified in New York: expectations, successes and failures, all played out every morning on the tabloids' back pages. This is a place where fifth is never good enough and where his legacy is not just a private preoccupation but a citywide saga. He thought coming to New York would increase his influence and amplify his voice, but instead he now believes it mostly distorted it. "I'm more misunderstood than most people," he says, and he can't escape the feeling that his reputation is solidifying and he is running out of time. "As an athlete, you don't really have a voice," he says. "Everything you say or do, people have a million opinions about it, so it doesn't really get heard the way you want it to get heard. People are putting things on you and shaping your reputation, and you don't really have control." And so that has become his preoccupation: Can he take back control with his investment company? Can he make enough money, or have enough success, or invest in enough home runs to claim total ownership of his legacy? As a tech entrepreneur, can he not be perpetually fifth but inarguably first? Can he feel in each moment like he did when he came out here onto the roof -- not swallowed by the swirl of the city but apart from it, free from judgment, in command of his own reputation? His quest isn't so much about money or basketball or new technologies. It is about the fear of seeing an imperfect career arc toward its end point and the desperation to create a legacy that lasts. It is about defining himself in a career in which he feels everyone else is already trying to define him. "Basketball, business ventures, tech -- whatever it is," he says. "I'm just hoping to be remembered for doing something great." 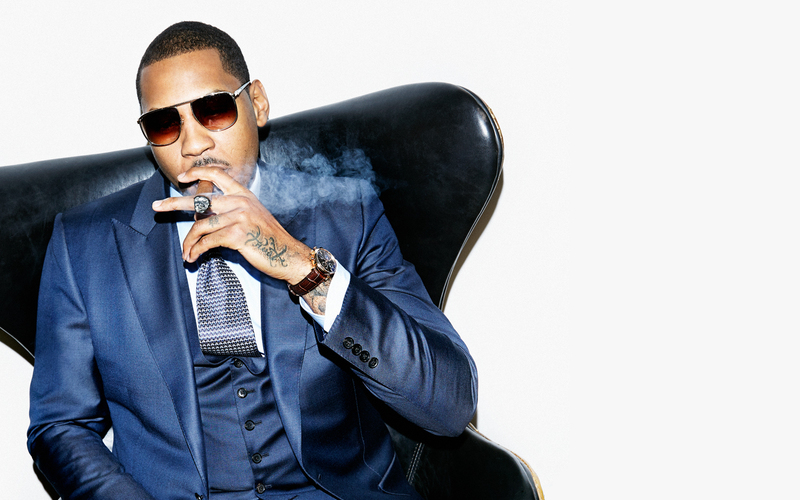 Join the conversation about "Carmelo Anthony Means Business."